SAN FRANCISCO -- A dog that was found severely injured in San Francisco's South of Market neighborhood on Thursday has been euthanized. The 1- to 2-year-old male pit bull terrier mix with brown and white fur, who shelter staff named Maximilian, was found at about 6 a.m. below the U.S. Highway 101 overpass near South Van Ness Avenue suffering from serious injuries, according to the city's Department of Animal Care and Control. In a statement, Deb Campbell with Animal Care & Control said that Maximilian was euthanized Sunday morning after suffering from kidney failure. 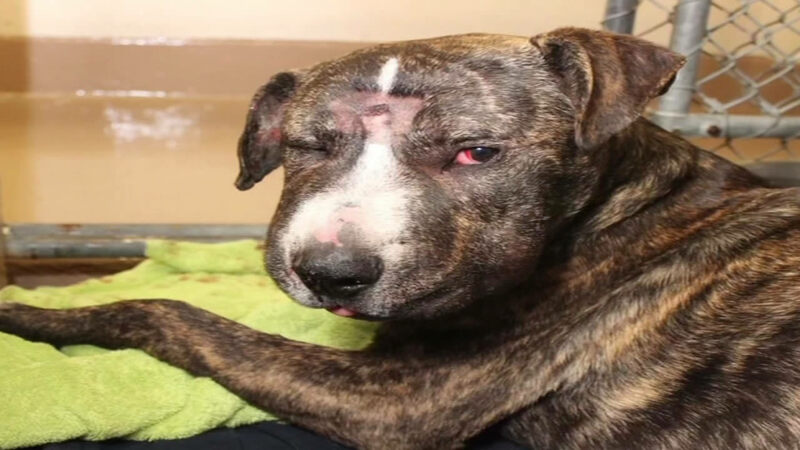 She went on to say, "He endured so much abuse that his body was not able to recover despite the vet staff's efforts. We are still pursuing leads to find the person who did this to him. Because of the tips generated by Maddie's Fund's reward, our officers were able to find Maximilian's owner. Maximilian had been stolen from him early last week. He loved and cared for Maximilian, and was horrified at what happened to his dog. He was able to be with Maximilian while he was euthanized. We will do our best to catch and prosecute whoever did this."